I love ghost stories and believe in the paranormal. I believe in ghosts and demons. I also have graduate degrees in clinical and counseling psychology and have been practicing as a licensed therapist in inpatient and outpatient psychiatric settings for more than fifteen years. As a writer and collector of ghost stories, I have noticed a distinct increase in articles and stories about demonic possession. I have good friends who have tried to classify demonic possessions. They tell histories of demonic possession and try to support those that are seeking an exorcism. On this blog, I have even written about the story behind the infamous exorcist possession. If any psychological or psychiatric professional in the world was going to argue and support the fact that demonic possession was a real spiritual state, it would be me. But in truth, I believe that there is nothing more dangerous and deadly to mental health care in the world than anyone supporting the delusion that demonic possession is a real thing. I know many of you may be mad at me for saying this, but please read on before you form any conclusions. I have been practicing for over fifteen years. In that time, a good 90% of my psychotic patients have had delusions revolving around demonic or spiritual attack of some kind. I live in a very religious area and the culture of Alabama supports these delusions. According to Pfeifer (Psychopathology, 1999), 56% of psychotic patients suffer from delusions with “demonic attributions.” Pfeifer found that belief systems play a strong role in how patients perceive and respond to their psychotic delusions. This means that if a patient hears the devil and feels the devil but strongly believes in mental health they will seek psychiatric care and recover. However, if a patient believes in the devil and seeks a preacher or witch doctor, they will never get psychiatric care and their condition will deteriorate. McCormik et al.’s researcher (Behavioral Neurology, 1992) supports this. It shows that culture and the belief system of the patient strongly predicts how a psychotic patient with delusions of “demonic attributions” will recover. The more primitive and steeped in the belief that possession is real the patient’s cultural and belief system are the less likely they are to recover. Recently, a patient I had been seeing for months shot herself in the head (This case study has been made false enough to protect the patient’s HIPPA rights but the guts of the story are real). For months, I had been trying to convince her to take her medication. She had been going to her preacher for fifteen years and he had convinced her she was possessed by the devil and that all her bad behaviors were the devil acting through her. Since she was psychotic and really didn’t want to take responsibility for beating her children and having them taken from her by CPS, she really wanted to believe her preacher. My answer was less appealing. It put personal responsibility on her. She beat her children. She could have stopped if she ever took her medicine. The preacher told her the devil had convinced her that her children wanted to kill her. She heard voices telling her that her children wanted to kill her. So she went through sixty-five independent exorcism rituals over the course of her life. Her family encouraged this. They didn’t believe in mental health care but they sure as hell believed in the devil. When she could no longer take the devil in her head, she killed herself. In session, she talked about all the websites she read that encouraged her to believe in possession. She talked about Emily Rose and the Exorcist. These things were real to her. She had been forced to take her medications twice in her life. Once when she was in jail and once when she wanted to get her children back. During these periods, she had improved, but families and preachers had always convinced her to stop her meds. When she stopped taking her medication, the devil returned. I have seen innumerable cases like this. I have won some battles and got patients to take their medications and been blessed enough to see how quickly medication can cure a demonic possession. I have lost some battles and had patients either refuse to take their medications or not take them long enough to see real change. I have never seen anything that would make me believe that any patient claiming to be possessed was actually influenced by a supernatural force. I have seen ghosts and shadow people. I don’t pretend they don’t exist, but I know possession doesn’t exist. My first run in with mental illness came when I was a very young girl. A family member of mine suffered from psychosis and believed the devil was trying to torment him. He sought help from a priest who called to have him admitted and he was forcibly admitted into the state hospital. Even most priests know that psychosis usually manifests in delusions of persecution and that persecution often has demonic overtones. I have been working with mental illness for a long time now and I know what it feels like to lose a patient and there is nothing more heartbreaking to me than when it isn’t the patient’s fault, but the fault of those around them, pushing them away from help that is so easily obtained. It wasn’t long ago that there was no help for psychosis. We had to give psychotic patients lobotomies, lock them up, or send them to priests and preachers. That was all there was. These things failed. Historically, they all always failed. The stories of the people who suffered through these treatments make the backbones of many of the most infamous ghost stories. But now we can really treat these ailments. These people can have somewhat normal lives. Why push them back into the darkness? There are several true possession stories I often hear told again and again as evidence that possession is real. One is the famous story of Emily Rose. This story dates back to 1974. Modern medicine has grown by leaps and bounds since this story. In neuropsychiatry and psychiatry, 1974 might as well be 1600. Yes, medicine couldn't help her then, but I would be willing to bet it could help her now. The first very limited antipsychotics weren't even invented until the 1960s. Clozapine wasn't invented until the 1960s and wasn't introduced to the public until the 1970s. So to site possession cases in the 1970s before the medications to treat psychosis were even available is to like saying you can't cure the plague and it was sent by the devil based on data from 1100. 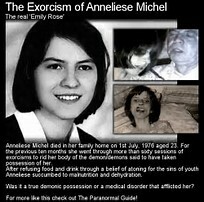 I am sure Emily Rose felt like the devil was tormenting her. There is nothing more tragic than talking to someone who is actively psychotic. Working with patients that are actively psychotic does feel like talking to someone influenced by the devil. They are really going through the trials of the devil. But these torments are now treatable with medicine. The truth is stories like Emily's are even more tragic because she was a very sick girl who could have been saved if she had lived now. I think it's out there longer than a few days.streaming a crisp 1080p HD copy for almost a week already.